You too can get #NPowered and acquire lifelong skills. Apply TODAY , June 13th by 11.30pm. Don't forget that you have to log on to www.npower.gov.ng This year, N-Power is happy to announce a new programme for 2017 applicants. It is called N-Power VAIDS. Please note that anyone who does NOT lodge complaints through the NPVN Help portal, email and on the approved official phone lines will NOT be attended to. The NPower team is committed to ensuring that the issues that many face are resolved. We advise that you follow the instructions diligently. The image below contains some of the responses to some of your questions on payment. According to Npower Program, Adiza Abubakar is a Masters degree holder, she had been job hunting for eight years. Another participant is grateful to N-Power for reviving her self worth as a Nigerian citizen. The NPOWER monitoring team was in Jalingo, Taraba state. We heard so many stories on the impact N-Power has had on the volunteers. They shared some of those stories on facebook. Musari Tijani: I do not trust this people again. I don't have any of the problems listed anymore and yet not paid. is better we find a way to media houses to air our voices since they deceiving us with non functioning means of reaching them. Npower Reply: Have you visited support.npvn.ng to see why you may not have been paid and if you qualified to be paid. Hawa Alabi: I was also verified in February and sent to primary school where am teaching currently,I spend N500 daily up til no I haven't received Kobo, I may stop if nothing is done am disappointed. Npower Reply: First of all, it is wrong that you are deployed to a place far from your home. NPower is to deploy volunteers to places close to their residence. Do you want to find out why? Chukwuemeka Nwaiwu: pls tell us in the skill acquisition segment/non graduate when our own turn will come? Since last year till now, many have left,disappointed with the way our section has been treated. Give us a date or time frame so that those who were patient with the program would end up enjoying the benefits of our long patience. Its been too too long. Emmanuel Ekoji: The Voluntary Asset and Income Declaration Scheme (VAIDS) seeks to encourage non-compliant and partially compliant taxpayers to voluntarily declare their correct income and assets and pay the appropriate tax due to the government. Ibrahim Adamu: One of the more shameful chapters of Npower So many Npower volunteers remain imprisoned, enslaved and in chains. They are trapped in the prison of backlog payment. It is time to set them free and pay their stipends salary from december to date. Yakubu Ibrahim Bawuro: I'm done complaining about my unpaid stipend, its like chasing a ghost. I've have been going to my place of primary assignment ever since i was posted in January but I'm yet to receive any stipend while my colleagues at the office get paid every month. I should have channelled my time and skills to something more profitable. Honestly, I'm hugely disappointed but God knows best. Ezenwa Akudo Okoro: Npower pls pay us our Stipends, most of us from Delta State are having blank payment history and we have done our physical verifications long time ago. Very heart breaking and annoying after working for more than 5 months going to 6months no payment while others have been paid. Please pay the people you have shortlisted in your 1st batch. Felix Ayorinde: Sincerely I don't understand why people are so desperate about this device. Assuming the device is not part of their promise, will you not apply for this program? in fact left to me, I want to believe there is a motif behind this forceful collection of Npower by some beneficiaries, if not we won't be talking this way. This government has really tried and we should give it to them. Even the issue of unpaid beneficiaries wasn't cause by Npower officials but the beneficiaries themselves caused all this. Many of them have been paid but the money is hanging because they've not done the needful by correcting their errors. Because you have been called doesn't really mean you are going to be paid. There are some issues that are beyond Npower officials to correct, like NON NUBAN, invalid BVN, mispelt name and so on. I only believe they can help with unmatched name. So if you were called, they only want to confirm if you are the owner of the account or not. I really wanna believe those that want to apply for this program are learning from our mistake because I cant just imagine this people going through the stress we passed through especially issue of payment. I encourage those that want to register to be extraordinary careful when registering for this program. Chukwuemeka Nwaiwu: @npower...what about the skilled acquisition segment of d program, the creative, tech, software,hardware n build aspects? since last year it has been postponed... are to reapply again or its safe to say that its been swept under the rug? Otunba Lawal Morounkeji John: #Npower# it is true that you people are moving and going around the country to see how things are moving. It is also true that some beneficiaries have been collecting their stipends since December till date but don't forget that not until all beneficiaries that were employed get their stipends for their sweat, your effort may not be effective as some of us from Jigawa are yet to be since December till date and we have been working and spending our little income on Npower without any return. So, please Npower should look into this issue of payment as a matter of urgency as I am one of the affected beneficiaries who are yet to be paid. Adetayo Turlar Bstaeo: As much as I want to completely laud the impact of this, the issue of volunteers' non-payment since December has been a major hiccup that strangling the positive impacts of the programme. After much correction at individual's bank, online (mail) complaint desk line, and calls received from Npower team itself to update participants' details and ensure payment, still volunteers still ended up not getting their highly anticipated payment promised to be paid along with the last phase of payment. I'll highly recommend that if BVN is what is causing these setbacks and disappointments, it is better to pay these hardworking, long-patient volunteers with their respective bank SORT codes; since they have been physically verified, cleared, posted and have been serving vehemently since the start of the programme. Let our Focal Person(s), please, pass this opinion up to the concerned authorities and help erase the tension and depression that these young Nigerians are currently undergoing. Most of them left their respective private jobs and little business to take up this Npower Job as an alternative to meeting up with their daily needs, but now they even find it hard to feed, neither do they have the option to go back to their previous place of work that was giving them little to feed. Please we need your ultimate action with this. Musodeeq Adekunle: Can you imagine !!! the image above has been on for a while and there's been rumor that its not real because its not been published on your platforms(website or facebook page) as a result,some people that have been called by those numbers refused to disclose thier BVN details to them for security reasons,now you're just publishing it ,what can such people do after there have been called and ignored the caller thinking its a scam.? Shuaibu Babagana Wakili: We appreciated your effort Npower officials, but really I hv never encountered such difficulties in my life like this time. I was been shortlisted in the first batch and verified since December but my name was nt in the list of verified volunteers. I was reverified again on 12 April but till now no any news. SINCERELY Speaking Yobe state NPOWER officials not the focal officer but the Computer department workers are very corrupt, they used to collect bribes before solving our problems. Most of us that our names appeared not on the verified volunteers list we don't have any problem with our documents and we were posted to various schools. we went back to confirm our verification last week and they said weren't been verified we should just forget about this program and wait apply the second batch. pls #NPOWER interfere in this issues. Godwin Uloko: We pray that God touch the heart of our leaders not to let us go back to the labour mkt again after the two years. Long live PMB! long live APC! long live Nigeria ! The only neutral recruitment exercise ever conducted in the history of Nigeria where a child of an ordinary man is given opportunity. Teddy Makpah: Indeed, npower has brought succor to so many of us.We are thankful to the Buhari's admin.However, we still want to appeal that we are made permanent,especially the Nteach as there is complete shortage of teachers in our schools, and by extension,it will cut down the rate of unemployment in the country.Once again, we say kudos to pmb. A few weeks ago, we shared on our Social media pages that N-Power would begin to pay the backlog owed to some beneficiaries. Yesterday, the payment of the first batch of 43,000 beneficiaries commenced. 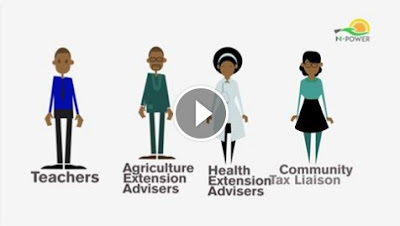 The Federal Government continues to work tirelessly to ensure this experience beneficial and rewarding for you. Npower believe that for every volunteer that is #NPowered, individual communities will benefit greatly. Ani Michael: Teachers employed under the scheme and sent to a particular Secondary School in Ika North East LGA in Delta State are nowhere to be found.Without proper monitoring,methinks the federal govt is a "father christmas"-giving out free money monthly. Npower Reply: Sir Ani Michael, thank you for bringing this to our attention. We will look into it. Onibalusi Akeem Kayode: pls npower I applied for the programme very early on 13th, June 2016/2017 with acknowledgment letter with NPB and ten digit reference no,but unfortunately for me my name did not come out for the first batch and now I,m jobless without any means of livelihood, pls I would like you to consider me for the second batch,may God bless npower team. Ikechukwu Emmanuel: #Npower, Please my question is on npower devices,when will this devices be available or there is no hope on it again or may be Nigeria corruption factor is in place. Long live federal Republic of Nigeria! Long live Npower. Uju Obiji-Luke: Good day Npower, I have not been paid my stipends since December till date. I have the problem of change of name, I am married so my bank details carries my husband but my certificate bears my madien name so I registered npower with my maiden name. i have forwarded my marriage certificate, change of name in newspapers, and affidavit to npower but the mail did not go through. I have gone to my focal persons but till now no change Has been done on my npower online profile. Please i need your help and direction on what next to do. 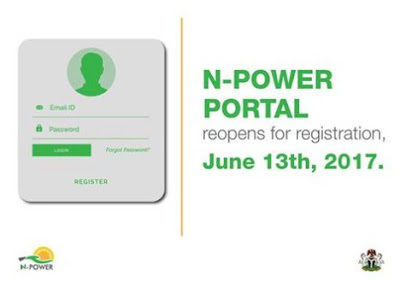 FG Extends Application Date Deadline For N-power Registration: How to apply for Npower Graduate Recruitment 2017? Has Npower Started? Yes. Npower Recruitment Application Closing Date. Not Specified.